It is now necessary to take up the history of the two great republics of the Western Mediterranean, Rome and Carthage, and to tell how Rome succeeded in maintaining for some centuries an empire even greater than that achieved by the conquests of Alexander. But this new empire was, as we shall try to make clear, a political structure differing very profoundly in its nature from any of the great Oriental empires that had preceded it. Great changes in the texture of human society and in the conditions of social interrelations had been going on for some centuries. The flexibility and transferability of money was becoming a power and, like all powers in inexpert hands, a danger in human affairs. It was altering the relations of rich men to the state and to their poorer fellow citizens. This new empire, the Roman Empire, unlike all the preceding empires, was not the creation of a great conqueror. No Sargon, no Thothmes, no Nebuchadnezzar, no Cyrus nor Alexander nor Chandragupta, was its fountainhead. It was made by a republic. It grew by a kind of necessity through new concentrating and unifying forces that were steadily gathering power in human affairs. But first it is necessary to give some idea of the state of affairs in Italy in the centuries immediately preceding the appearance of Rome in the world’s story. Figure 381: Map — The Western Mediterranean, 800-600 B.C. Before 1200 B.C., that is to say before the rise of the Assyrian empire, the siege of Troy, and the final destruction of Cnossos, but after the time of Amenophis IV, Italy, like Spain, was probably still inhabited mainly by dark white people of the more fundamental Iberian or Mediterranean race. This aboriginal population was probably a thin and backward one. But already in Italy, as in Greece, the Aryans were coming southward. By 1000 B.C. immigrants from the north had settled over most of the north and centre of Italy, and, as in Greece, they had intermarried with their darker predecessors and established a group of Aryan languages, the Italian group, more akin to the Keltic (Gaelic) than to any other, of which the most interesting from the historical point of view was that spoken by the Latin tribes in the plains south and east of the river Tiber. Meanwhile the Greeks had been settling down in Greece, and now they were taking to the sea and crossing over to South Italy and Sicily and establishing themselves there. Subsequently they established colonies along the French Riviera and founded Marseilles upon the site of an older Phoenician colony. Another interesting people also had come into Italy by sea These were a brownish sturdy people, to judge from the pictures they have left of themselves; very probably they were a tribe of those Aegean»dark whites» who were being driven out of Greece and Asia Minor and the islands in between by the Greeks. We have already told the tale of Cnossos (Chapter XV) and of the settlement of the kindred Philistines in Palestine (Chapter XIX, sec 1). These Etruscans, as they were called in Italy were known even in ancient times to be of Asiatic origin, and it is tempting, but probably unjustifiable, to connect this tradition with the Aeneid the sham epic of the Latin poet Virgil, in which the Latin civilization is ascribed to Trojan immigrants from Asia Minor. (But the Trojans themselves were probably an Aryan people allied to the Phrygians.) These Etruscan people conquered most of Italy north of the Tiber from the Aryan tribes who were scattered over that country. Probably the Etruscans ruled over a subjugated Italian population, so reversing the state of affairs in Greece, in which the Aryans were uppermost. 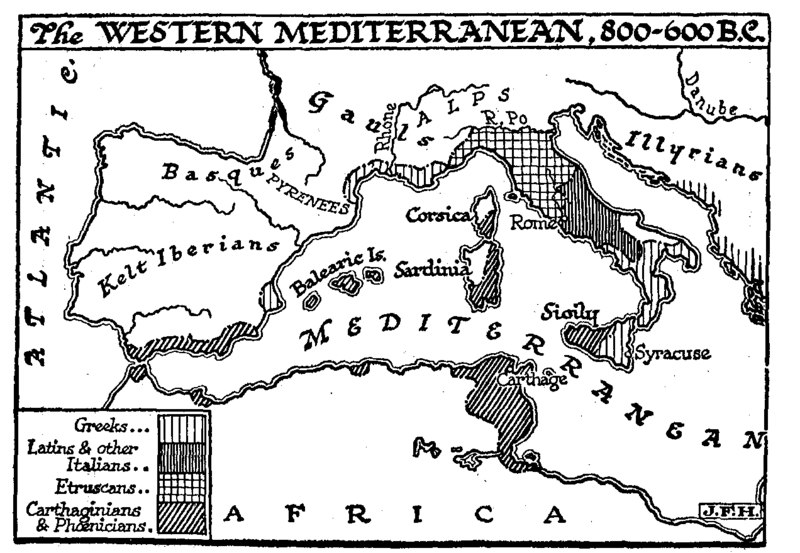 Our map (Figure 381: Map — The Western Mediterranean, 800-600 B.C. 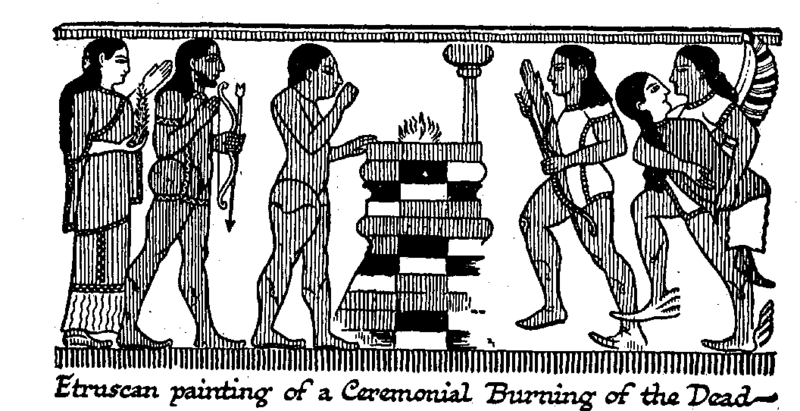 ), which may be taken to represent roughly the state of affairs about 750 B.C. also shows the establishments of the Phoenician traders, of which Carthage was the chief, along the shores of Africa and Spain. Of all the peoples actually in Italy, the Etruscans were by far the most civilized. They built sturdy fortresses of the Mycenaean type of architecture; they had a metal industry; they used imported Greek pottery of a very fine type. The Latin tribes on the other side of the Tiber were by comparison barbaric. The Latins were still a rude farming people. ‘The centre of their worship was a temple to the tribal god Jupiter, upon the Alban Mount. There they gathered for their chief festivals very much after the fashion of the early tribal gathering we have already imagined at Avebury. This gathering place was not a town. It was a high place of assembly. There was no population permanently there. There were, however, twelve townships in the Latin league. At one point upon the Tiber there was a ford, and here there was a trade between Latins and Etruscans. At this ford Rome had its beginnings. Traders assembled there, and refugees from the twelve towns found an asylum and occupation at this trading centre. Upon the seven hills near the ford a number of settlements sprang up, which finally amalgamated into one city. Most people have heard the story of the two brothers Romulus and Remus, who founded Rome, and the legend of how they were exposed as infants and sheltered and suckled by a wolf. Little value is now attached to this tale by modern historians. The date 753 B.C. is given for the founding of Rome, but there are Etruscan tombs beneath the Roman Forum of a much earlier date than that, and the so-called tomb of Romulus bears an indecipherable Etruscan inscription. The peninsula of Italy was not then the smiling land of vineyards and olive orchards it has since become. It was still a rough country of marsh and forest, in which the farmers grazed their cattle and made their clearings. 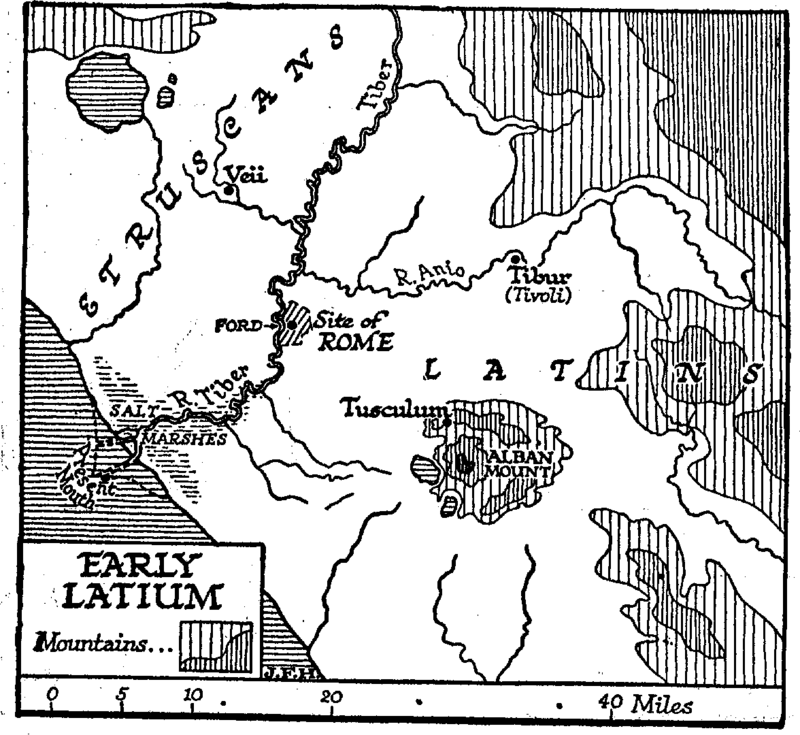 Rome, on the boundary between Latin and Etruscan, was not in a very strong position for defence. At first there were perhaps Latin kings in Rome then it would seem the city fell into the hands of Etruscan rulers whose tyrannous conduct led at last to their expulsion, and Rome became a Latin-speaking republic. The, Etruscan kings were expelled from Rome in the sixth century B.C., while the successors of Nebuchadnezzar were ruling by the sufferance of the Medes in Babylon, while Confucius was seeking a king to reform the disorders of China, and while Gautama was teaching the Aryan Way to his disciples at Benares. Of the struggle between the Romans and the Etruscans we cannot tell in any detail here. The Etruscans were the better armed, the more civilized, and the more numerous, and it would probably have gone hard with the Romans if they had had to fight them alone. But two disasters happened to the Etruscans which so weakened them that the Romans were able at last to master them altogether. The first of these was a war with the Greeks of Syracuse in Sicily which destroyed the Etruscan fleet (474 B.C. ), and the second was a great raid of the Gauls from the north into Italy. These latter people swarmed into North Italy and occupied the valley of the Po towards the end of the fifth century B.C., as a couple of centuries later their kindred were to swarm down into Greece and Asia Minor and settle in Galatia. The Etruscans were thus caught between hammer and anvil, and after a long and intermittent war the Romans wore able to capture Veii, an Etruscan fortress, a few miles from Rome, which had hitherto been a great threat and annoyance to them. It is to this period of struggle, against the Etruscan monarchs, the Tarquins, that Macaulay’s Lays of Ancient Rome familiar to every schoolboy, refer. But the invasion of the Gauls was one of those convulsions of the nations that leave nothing as it has been before. They carried their raiding right down the Italian peninsula, devastating all Etruria. They took and sacked Rome (390 B.C.). According to Roman legends-on which doubt is thrown-the citadel on the Capitol held out, and this also the Gauls would have taken by surprise at night, if certain geese had not been awakened by their stealthy movements and set up such a cackling as to arouse the garrison. After that the Gauls, who were ill equipped for siege operations, and perhaps suffering from disease in their camp, were bought off, and departed to the northward again, and, though they made subsequent raids, they never again reached Rome. The leader of the Gauls who sacked Rome was named Brennus. It is related of him that as the gold of the ransom was being weighed, there was some dispute about the justice of the counterpoise, whereupon he flung his sword into the scale, saying, «Vae victis!» («Woe to the vanquished!») a phrase that has haunted the discussions of all subsequent ransoms and indemnities down to the present time. For half a century after this experience Rome was engaged in a series of wars to establish herself at the head of the Latin tribes. For the burning of the chief city seems to have stimulated rather than crippled her energies. However much she had suffered, most of her neighbours seem to have suffered more. By 290 B.C. Rome was the mistress city of all Central Italy from the Arno to south of Naples. She had conquered the Etruscans altogether, and her boundaries marched with those of the Gauls to the north and with the regions Of Italy under, Greek dominion (Magna Graecia) to the south. Along the Gaulish boundary she had planted garrisons and colonial cities, and no doubt it was because of that line of defence that the raiding enterprises of the Gauls were deflected eastward into the Balkans. 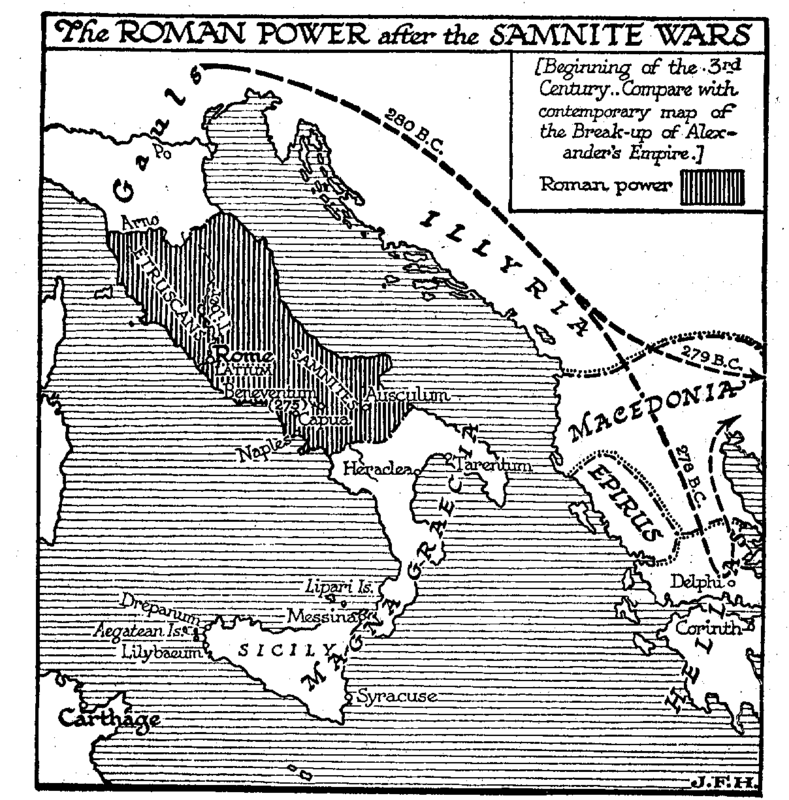 After what we have already told of the history of Greece and the constitutions of her cities, it will not surprise the reader to learn that the Greeks of Sicily and Italy were divided up into a number of separate city governments, of which Syracuse and Tarentum (the modern Taranto) were the chief, and that they had no common rule of direction or policy. But now, alarmed at the spread of the Roman power, they looked across the Adriatic for help, and found it in the ambitions of Pyrrhus, the king of Epirus. Between the Romans and Pyrrhus these Greeks of Magna Graecia were very much in the same position that Greece proper had been in, between the Macedonians and the Persians half a century before. Beginning of the 3rd century. Compare with the contemporary Figure 339: Break-up of Alexander’s Empire. The reader will remember that Epirus, the part of Greece that is closest to the heel of Italy, was the native land of Olympias, the mother of Alexander. In the, kaleidoscopic changes, of the map that followed the death of Alexander, Epirus was sometimes swamped by Macedonia, sometimes independent. This Pyrrhus was a kinsman of Alexander the Great, and a monarch of ability and enterprise, and he seems to have planned a career of conquest in Italy and Sicily. He commanded an admirable army, against which the comparatively inexpert Roman levies could at first do little. His army included all the established military devices of the time, an infantry phalanx, Thessalian cavalry, and twenty fighting elephants from the east. He routed the Romans at Heraclea (280 B.C. ), and pressing after them, defeated them again at Ausculum (279 B.C.) in their own territory. Then, instead of pursuing the Romans further, he made a truce with them, turned his attention to the subjugation of Sicily, and so brought the sea power of Carthage into alliance against him. For Carthage could not afford to have a strong power established so close to her as Sicily. Rome in those days seemed to the Carthaginians a far less serious threat than the possibility of another Alexander the Great ruling Sicily. A Carthaginian fleet appeared off the mouth of the Tiber, therefore, to encourage or induce the Romans to renew the struggle, and Rome and Carthage were definitely allied against the invader. 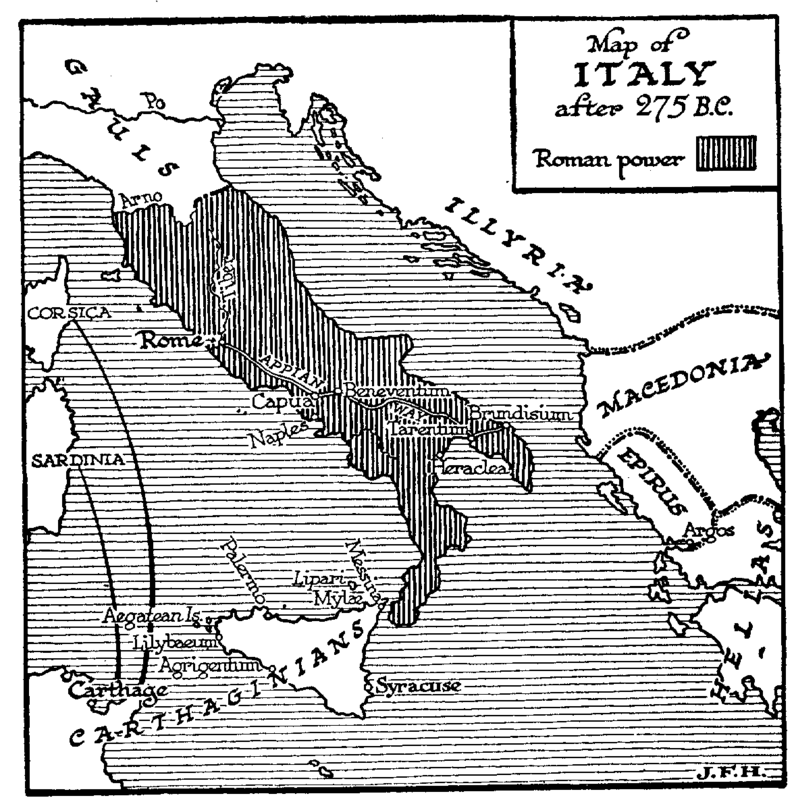 Figure 387: Map of italy after 275 B.C. This interposition of Carthage was fatal to Pyrrhus. Without any decisive battle his power wilted, and, after a disastrous repulse in an attack upon the Roman camp of Beneventum, he had to retire to Epirus (275 B.C.). It is recorded that when Pyrrhus left Sicily, he said he left it to be the battleground of Rome and Carthage. He was killed three years later in a battle in the streets of Argos. The war against Pyrrhus was won by the Carthaginian fleet, and Rome reaped a full half of the harvest of victory. Sicily fell completely to Carthage, and Rome came down to the toe and heel of Italy, and looked across the Straits of Messina at her new rival. In eleven years’ time (264 B.C.) the prophecy of Pyrrhus was fulfilled, and the first war with Carthage, the first of the three Punic Wars, had begun. Latin Poeni = Carthaginians. Punicus (adj.) = Carthaginian, i.e. Phœnician.